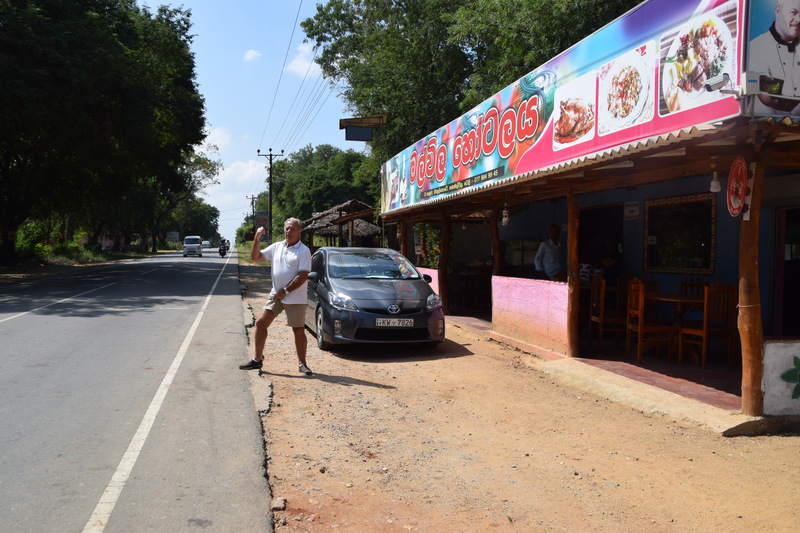 Today we had to be ready by 9am as we had a long drive to Yala – some 3 hours but on the way we first stopped at the waterfalls of Rahana. These were really impressive – masses of water coming down the mountain and at one point, there was this one local bathing himself in the fresh water then at one point he lathered his head with shampoo – I wasn’t too sure whether he was using eco friendly shampoo….. Within no time we left the luscious rain forests in the mountains and came to the open plains filled with rice paddies which were turning into a golden colour ready for harvesting. We badly needed a sanitary stop plus Gerry needed his smoke and we all wanted a snack or drink. Indika spotted a local hotel which had everything we needed. 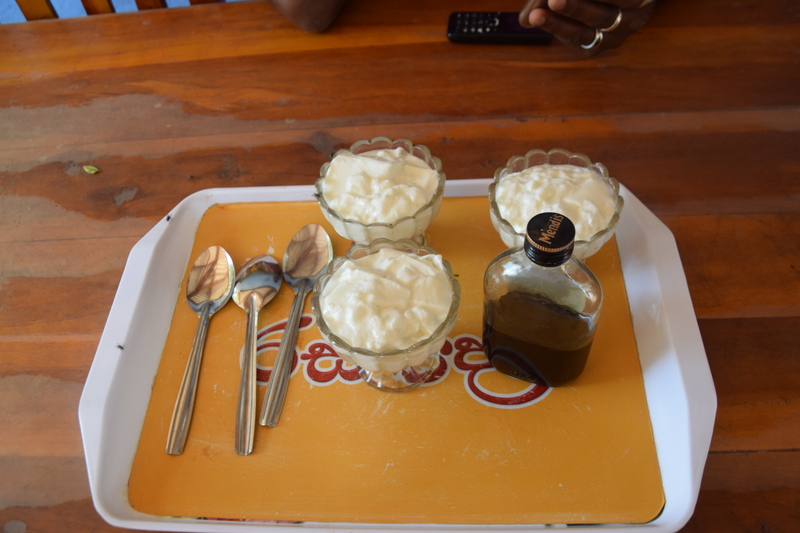 As I just wrote it was a local hotel so the washroom facilities were a hole in the ground – I am getting quite handy using these toilets…… anyway as a snack we ordered the local buffalo curd with coconut treacle – just what we needed to revitalize us – and then another one and half hours to drive to Yala. Ceramic pots filled with fresh buffalo curd which we ordered together with coconut treacle – ever so tasty and healthy! Yala is quite a big town focusing on the National Park tourism, all coming to spot mainly leopards besides crocodiles, elephants and deer. Well being that we were going on a game drive, I had requested that we spend the night at a campsite – Yala Big Game Camp Site – situated just outside the National Park. 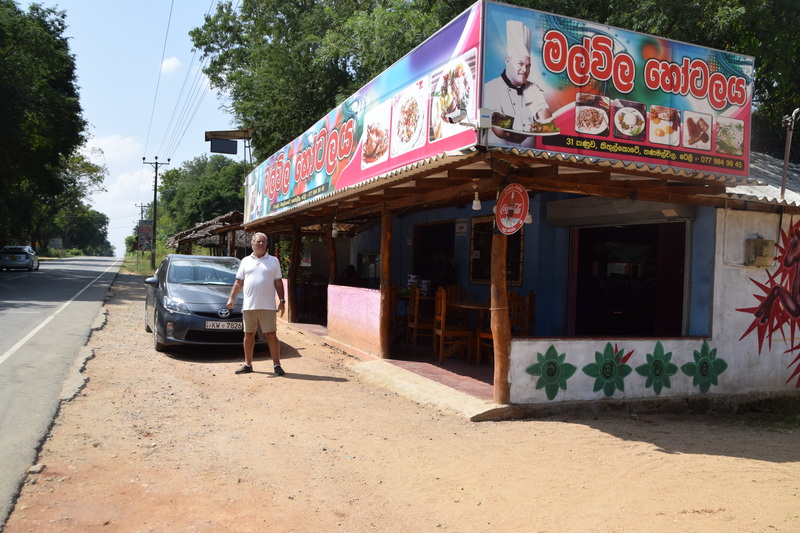 Indika brought us first to a restaurant where we had a light lunch before setting out on our safari. Apparently most jeeps picked up their clients from this spot and drove through to the park. Anyway finally we spotted him sitting on a branch and then walking slowly and sitting again – I did manage to get some good shots! Then there was some foliage rustling quickly and the big cat jumped up a tree and a iguana came running for his life……..
And finally the leopard gave up on watching us and knelt away and climbed into a tree! Bij mama (or papa) helping the little one cross over…. All in all we spent some five hours in the park and by the time we made our way to the campsite, it was pitch dark. We had to be collected by Jeep at the entrance of the campsite and Indika left us after we were picked up and went to his own lodgings close by. It was such a pity that we arrived when it was already dark as the only lighting we had was kerosene lamps. We were in time to freshen up in our tent (yes, we had our own wash basin, toilet and shower at the back of the tent) and go to the main area where we could have a drink first and then a BBQ dinner. It was simply marvelous to sit a dinner table for two – set with white linen tablecloth and enjoy a three course meal…. Usha was the camp manager and she was very attentive to all her guests.